Looking for something fun to do this weekend? 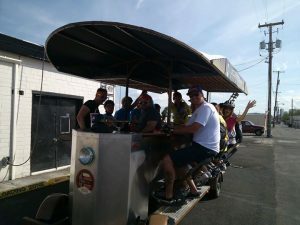 Whether you’re a Las Vegas local or just in town for a weekend trip with the buddies, Vegas Pub Crawler offers a totally unique way to crawl the pubs. 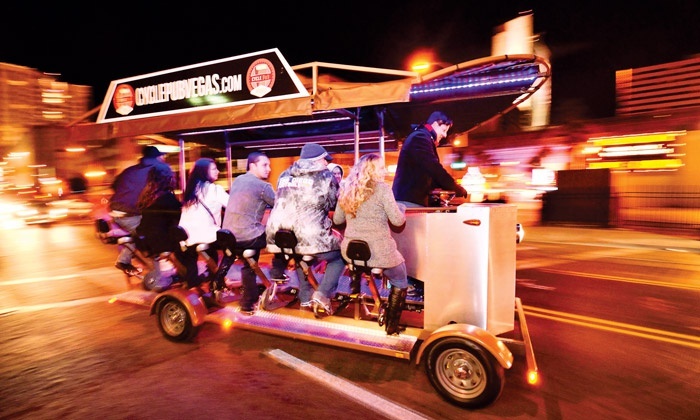 This 2-3 hour tour will take you to some of best pubs and eateries in Downtown Las Vegas, all while you ride around on a bonafide pub-on-wheels appointed with 14 bicycle seats and pedals. It might not be stylish, but it sure is fun! If you happen to have any music with you, on your phone or other device, you can hook it up to the cycle’s stereo system and listen to your favorite tunes while you pedal around downtown. You’ll start off your trip in front of Pizza Rock in Downtown Las Vegas. Depending on the size of your group, other crawlers may join your ride. Once you’ve met your Vegas Pub Crawler guide, you’ll start peddling off to the first destination on your crawl. You should expect to make about 4-6 stops on each pub crawl such as Atomic Liquors, Commonwealth, Gold Spike and more. This means you’ll be spending about thirty minutes at each stop, enough to grab a few drinks, before you move on to the next pub. All of the locations on Vegas Pub Crawler are within close proximity of each other so you won’t be peddling too far between pubs, even though traveling on the bike is a lot of fun. Each Vegas Pub Crawl tour is completely customized based on which bars you want to visit, so make sure you let your guide know which bars have piqued your interest. Vegas Pub Crawler is also perfect for groups as many of the bars offer specials for groups on the crawl so be sure to ask your guide about these before you set off. The crawl also makes stops at some of Downtown’s best eateries if you’re feeling hungry, including Pizza Rock, Nacho Daddy and more. Next time you’re feeling a bit bored or visiting Las Vegas with friends, come down and check out Downtown Las Vegas’ flourishing bar scene on a Vegas Pub Crawler tour!